With the printing of his 42-line, or Mazarin Bible, Johann Gutenberg introduced printing with moveable type to Western Europe. The impact of the products of printing cannot be underestimated, for this technology allowed the written word to be reproduced and disseminated quickly, cheaply, and in enormous quantities. 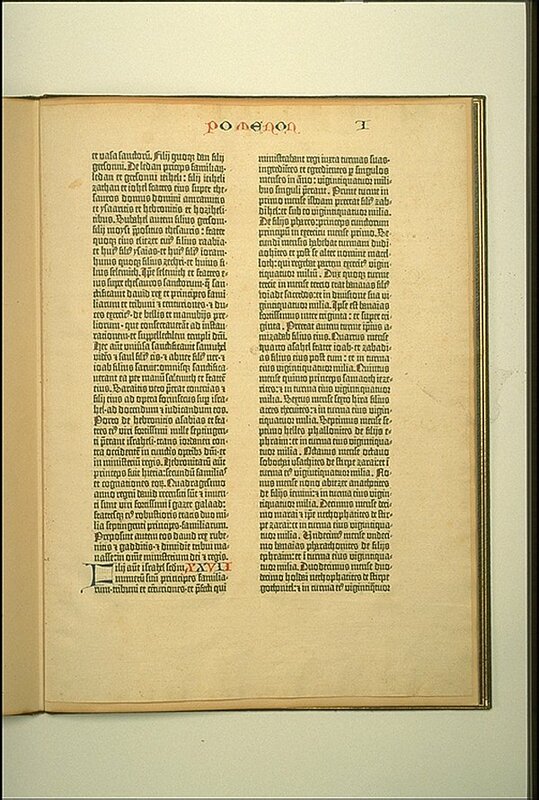 In less than fifty years after the printing of this page, more than ten million printed books had been produced. The pages of the Gutenberg Bible, printed with a Gothic type similar to handwriting of the period and region, are divided into two columns. This leaf is printed on paper. It is thought that Gutenberg printed 165 copies on paper and thirty-five copies on parchment. Of this total, only forty-eight Gutenberg Bibles are known to have survived.